With a history dating back 160 years as one of Scotland’s leading independent manufacturers of traditional sweets and confectionery, New McCowans (Scotland) Ltd know a thing or two about sweeties and are passionate about the quality of their products. When New McCowans needed a new sugar mill for their manufacturing plant in Stenhousemuir, near Falkirk, they had no hesitation in approaching Kek-Gardner. 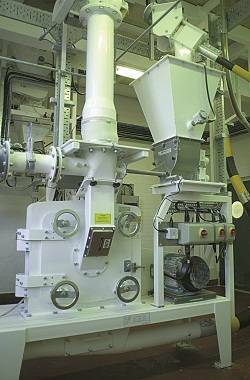 A KEK Universal mill had been running problem free at their Edinburgh site for 20 years with only one bearing change needed during all that time so they were confident about Kek-Gardner’s capabilities and expertise in the field of sugar milling. On site production space is at a premium and this was a major consideration for Engineering Manager, Ian Love, when he needed to boost the production of sugar for one of their boiled sweet lines. The space restriction was a key requirement in defining the mill’s layout and specification to ensure a trouble free installation. Traditional milling system designs have a filtered air intake at the material feed point. Air acts as the ‘carrier’ for the product through the mill and as a result has to be filtered out of the system at the milled product collection point. The filter required to separate milled product from the air can be very costly and the size of the filter unit can cause significant problems where space is at a premium. The explosion risk associated with finely divided powders entrained in an air stream was an additional complication. Faced with these challenges, Kek-Gardner proposed a 10 bar rated 3H KEK Universal Mill, based on a closed loop re-circulation system. Once closed up, and ready to run, no additional air is introduced into the loop and therefore there’s no requirement to remove it after milling. The air carrying the product is continually re-circulated back to the mill inlet. Using this approach at New McCowans (Scotland) Ltd made it possible to eliminate the need for bulky and expensive air filtration and explosion venting – offering a cost effective, quiet running mill at the same time. Mr Love was pleased by the way that Kek- Gardner had tailored their proposal to cope with his requirements. They gave him the confidence that they could do the job and demonstrated their ability to meet the process specification through trials in their Technology Centre in Macclesfield. was competitive compared with another supplier we looked at and thirdly, KEK-Gardner’s technical expertise and support was on hand throughout the job…..they know what they are doing!"